We could hardly be more excited by the scents of NY husband-and-wife duo D.S. 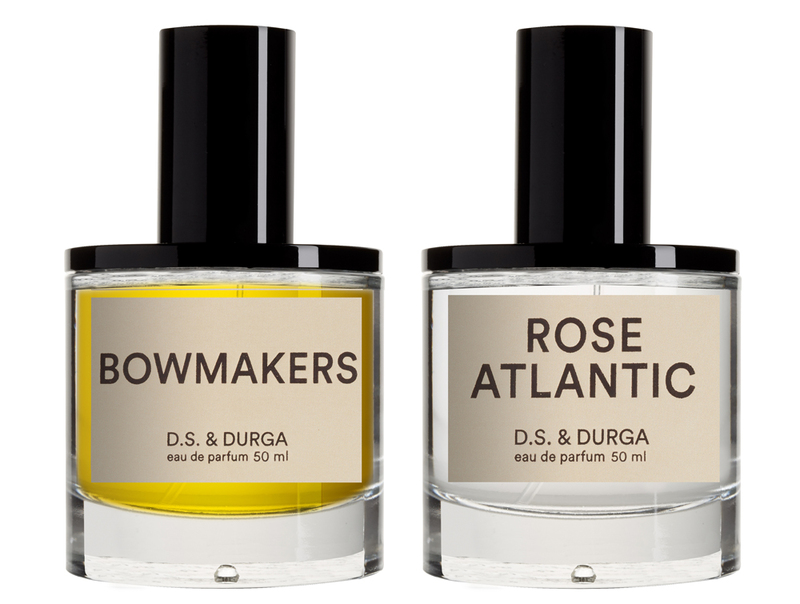 & Durga (aka self-taught perfumer David Seth Moltz and the brand’s designer Kavi Moltz, a former architect). Pioneers in the DIY scent movement that flourished in post-millennium Brooklyn, they now operate on the appealing principle that ‘perfume is armchair travel’, creating wearable scents and candles that ‘conjure unseen worlds’. Their influences include music, art, nature and design. Highlights among the wearables include 'Bowmakers', inspired by the 19th-century violin craftsmen of the Massachusetts Bay Colony, which fuses notes of violin varnish with mahogany and spiced tree resin; and 'Rose Atlantic', a bracing blend of salt spray and voluptuous roses that riffs on Sinatra’s song Summer Wind. Both come in appealingly graphic bottles with glossy black lids. Thinking in 'angles, light, shadow and texture', Kavi seeks to create clarity in form and function for the houses of the brand's scents. The candles are packaged in apricot glass with evocative illustrations. 'Portable Fireplace' is a regular sellout, with its smoky whiff of dwarf pine, oak ash, copaiba resin and birch tar; '’85 Diesel' is a witty take on car interiors, with the notes listed as ‘saffron leather, suede, vinyl, diesel smoke and earth dirt’. If you like your scents down and dirty, this is where it’s at.